Although TESTOsterone Enanthate has a period of action longer then few weeks, is used by bodybuilders, power-lifters and athletes. The major priority is the fact that has active chemical substance has a strong androgenic and anabolic effect. This means that any athlete can, by using TESTOsterone Enanthate, increase its power and weight in minimal time. The fast and considerable increase in weight is correlated with the liquids retained in organism. For the bodybuilders, the water retained, caused by the use of TESTOsterone Enanthate can determine adverse reactions, it is possible to become strong in a short period of time but in a few weeks, in the mirror you could see a muscle weight that is plat, smooth, edemathic, that would have been inflated until this level and no matter how hard you try to stretch it there is no result. If you don?�?�?�????????? ?t believe, you should observe the bodybuilders between the competitions or in the periods when the muscle weight increases, when they absorb big quantities of TESTOsterone. Another problem about the administration of TESTOsterone Enanthate is the fact that this product is transformed in estrogens very quickly. This is the reason why the body stock fats and usually appears the gynaecomastia. Many aspects depend from person to person because in most cases the reactions are correlated with the fact that they are predispose to them. There are athletes that even at a dose of 100mg/day or even more aren?�?�?�????????? ?t affected by the feminization process, they don?�?�?�????????? ?t stock fats and retain only an insignificant quantity of water. Some when retain water , they accuse pain in the teats areas. 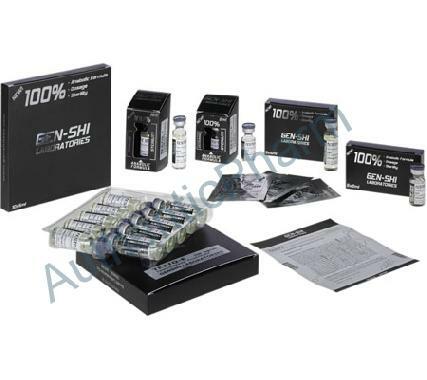 TESTOsterone Enanthate is a good stimulant in the body process of regeneration, this is the reason why it has a good action when it comes to increases the vitality and the energy and also in the compensation phases; many athletes can make practice 6 day/week, twice a day and they manage to become bigger and stronger. The bodybuilders who use TESTOsterone Enanthate tell about the pumping effect during practice, this ?�?�?�????? ?�steroid pumping?�?�?�??????? is the result of the increasing blood volume and providing the body with oxygen and an important quantity of red cells . The administration of Enanthate TESTOsterone is efficient to those who have articulations problems, who accuse pain in the shoulders and have pain symptoms in the jointments. For the more developed athletes, TESTOsterone Enanthate can be used simple or in combination with other products. To increase your muscle weight, the TESTOsterone Enanthate is combined with Anapolon 50, Dianabol, Deca-Durabolin and Parabolan. An example is the combination of 100mg Anapolon 20 daily, 200mg Deca-Durabolin weekly and 500mg of Enanthate TESTOsterone weekly. After 6 weeks the Anapolon can be replaced with 30mg of Dianabol daily. It seams that between the androgen TESTOsterone Enanthate and other anabolic steroids appears the synergy effect. The athletes that, after using the TESTOsterone Enanthate, Dianabol or Anapolon, have retains of liquids in organism, or are interested in increasing the straight without increasing the weight as well should administrate TESTOsterone Enanthate only in combination with Oxandrolon or Winstrol. The admitted dose of TESTOsterone Enanthate, as we mentioned before is between 250mg/week to 2000mg/week. For most athletes the reasonable limit would be between 250-1000mg/week. Normally the higher doses aren?�?�?�????????? ?t needed. The 500mg/week are usually administrated in one dose that means it is injected directly 2ml. A higher dose should be divided in 2 injections/week.